Every design in Showit includes matching blog templates that can be customized along with the rest of your site. The top two pricing tiers include blog hosting powered by Wordpress. Once you have subscribed and are ready to launch your site design, you can request a blog setup or migration in your Showit account settings. 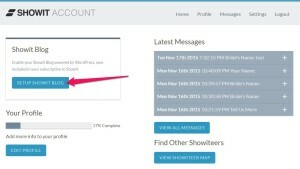 If you have a blog with posts on your current site, those posts can be migrated to your new Showit hosted blog. Our team will handle the entire migration process for Tier 2 & 3 users. Tier 2 migrations will only support the import of post content (text and images), not themes or plugins. A migration should only be started when you are ready to launch your Showit site. Once your blog is setup, you can then choose which design will publish to your blog from the Site Settings of a Showit Site Design on the Blog tab. To design your blog, continue on to Start Customizing Your Blog Design.